Annie Sharma did her schooling from Rajpur Inter College and after that she did basic cooking training at Cafe Chhaya. It took her almost a year to get perfect in everything like taking orders, talking to clients, getting food on time, making shakes and other drinks. She is working with Chhaya Cafe as Cafe Manager. 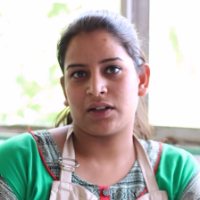 "I did my schooling from Rajpur Inter College, Dehradun and after that did my basic cooking training at Chhaya Cafe. I am working as a Cafe Manager at Chhaya Cafe."